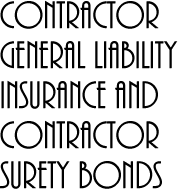 Welcome to Contractor General Liability Insurance and Contractor Surety Bonds. We are here to represent the construction industry and offer up information on the various insurance and bonds that you need in order to do business. Construction bonds and the various types are confusing and we can help you clear up some of that confusion. We offer information on the various types of bonds and when and where they are necessary. If you want your business to grow and take on bigger projects then you need to understand the legal issues involved and how to protect everyone associated with a project. If you have any questions about any of the content on our site then please contact us.